Mailcoms are pleased to announce the addition of the amazing Connect+ colour printing franking machines to its already comprehensive range. Using colour print on envelopes is proven to boost response to direct mail campaigns. It increases open rates, which in turn increases response. After all, if your mail doesn’t even get opened, it won’t get the response you want. With the Connect+ Customer Communication Series of franking machines you can use that same technique on other mail you send. Invoices, statements or reminders can become impossible to ignore with incentives printed on the outside of the envelope. Plus, you can use it to make your promotional mailings more effective in a flexible and convenient way. The Connect+ range comes in 2 models the Mailpoint and the Mailpoint+, the Mailpoint+ also offers full 'in motion' weighing and measuring as it travels through the machine. 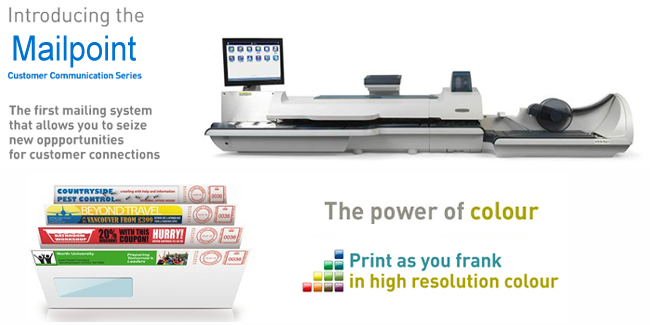 At print speeds of up to 180 letters per minute the new Connect+ Mailpoint Range is the must have for any mailroom. For more information please CLICK HERE or call 08450 530930.